It’s the end of our first full day serving as a family at Gleanings for the Hungry in Dinuba, CA. We are all weary from a day worn well. As I lay down to rest and reflect, I can’t help but smile as I replay favorite memories from the day in my mind. 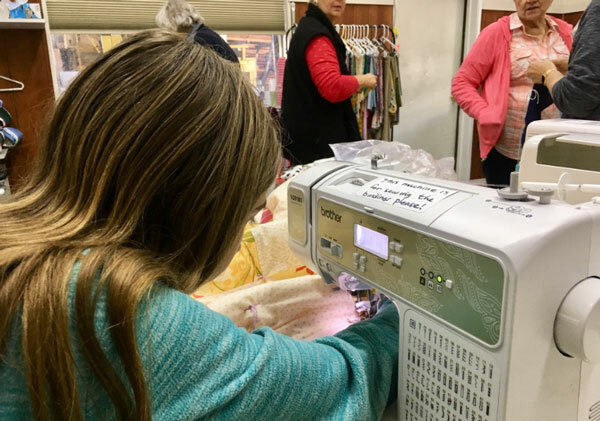 -Ashlyn, invited to sit down at the sewing machine in the quilt room and stitch the final hem to finish off the hand-made quilt that will be sent to Mexico. 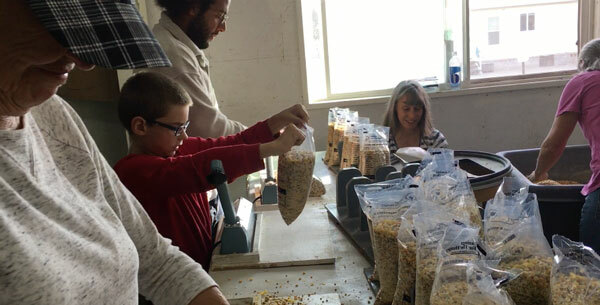 -Quinten and Tanner working in the soup room assembly line catching the dried mix into bags. -Hunter keeping pace by heat-sealing the bags. 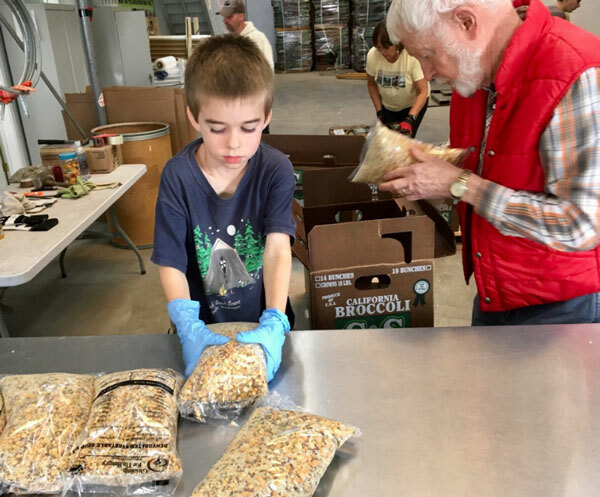 -Tanner packing the soup-mix bags with fervor into boxes for shipment. -Trent lifting the finished boxes onto the pallet for shipment to South Africa. We’ve spent the day in a beautiful ebb and flow of work and rest, eating and fellowshipping alongside a wonderful mixture of volunteers. 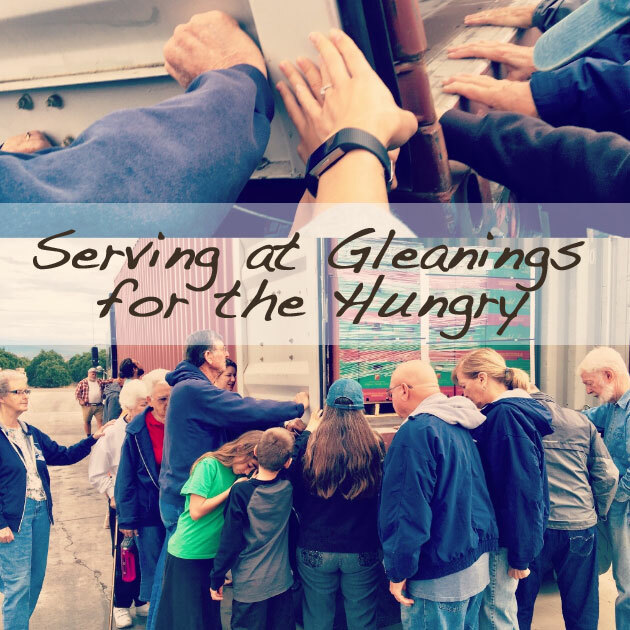 As the week progresses, so does our understanding for the broad scope of ministry done here at Gleanings. 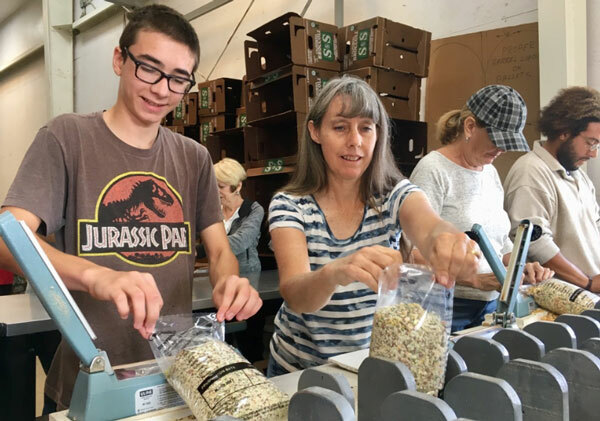 We realize the unique network of farmer relationships that allows Gleanings to take food that would normally be wasted and turn it into someone else’s blessing. 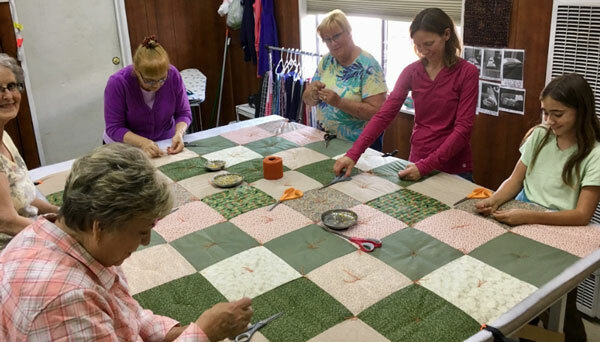 We see that it’s not all about food as the quilt room comes alive with creative energy. 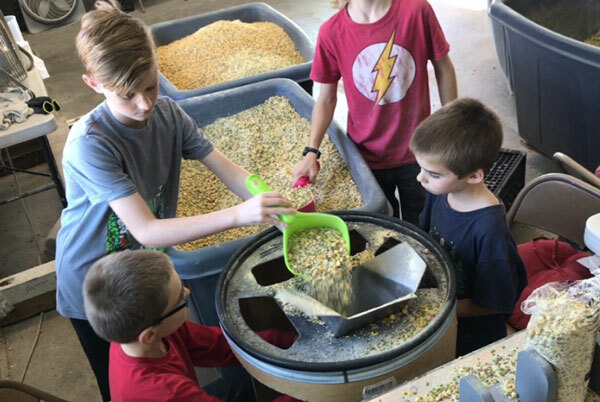 We learn about the connection that Gleanings has to Youth With a Mission and the five month Discipleship Training School they run. 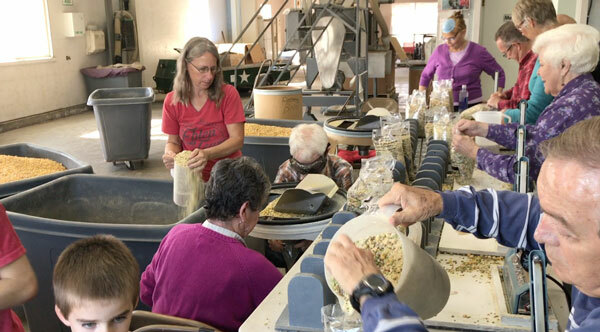 We even discover a connection between Gleanings and GAiN (Global Aid Network which we visited last May in Pennsylvania). As we show up each morning, mid-morning, noon, mid-afternoon and evening for meals and snacks, we are fed not only physically but spiritually as we get to know staff and students working and living on-site. Here the body of Christ (both young and old) have come together with beautiful harmony and contribute equally to Kingdom work. 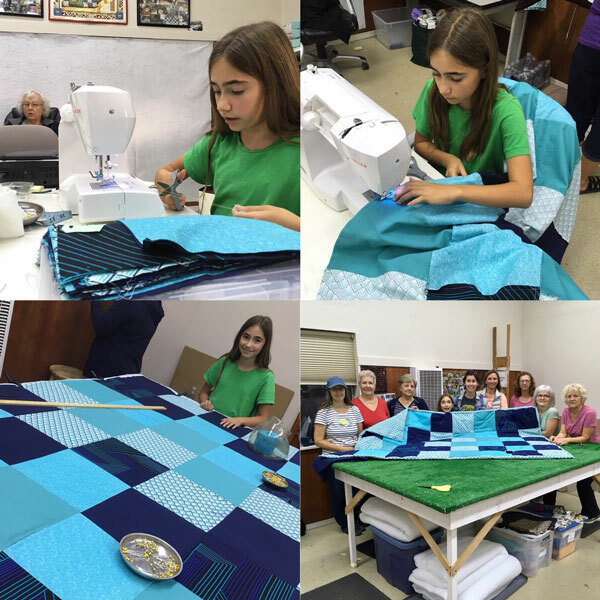 By the close of the week, Ashlyn puts the finishing touches on a quilt she’s designed and sewn from start to finish. It was a big project with a few tearful, frustrated moments. However, her perseverance pays big dividends in the end knowing her quilt will soon keep someone warm. Before leaving, we have the honor of praying over the shipment of food we have packed. As our hands and hearts reach out to prayerfully embrace those who will take our efforts to precious ones far off in South Africa, it becomes easy to see why most of the volunteers standing around us have embraced this opportunity to serve by returning to Gleanings year after year. I’m not sure it’s possible to spend a week here without being touched and changed in the best ways possible. Number of RV spots: 20 (most with full-hook ups). They also have housing available for those who are not bringing their RV with them. Volunteer duration: typically 5 days (although longer options of 2 weeks to 3 months are available as well). Who can volunteer: Singles, couples or families are welcome (even the young ones can help). Time of year: year-round. Visit their website to read about the different needs they have throughout the year. Additional details: Laundry facilitates are available with a $1.00 suggested donation. Meals and snacks are provided on work days (they feed you well). There is a suggested per night donation to help cover costs. More FAQ’s are found here. Their booking request form is found here. Want a few more details and perspectives? I’ve been working on creating a page detailing family (and RV) friendly service options throughout the US. I welcome you to use it and share it with others. It’s a resource I hope to add to as time goes on and I hope you will inform me of any great options I may have missed! What an incredible experience! I’m sure you all learned and grew so much, as individuals and as a family! Thanks for sharing, you did so is such a humble, helpful way. I am so glad you enjoyed the post, it was a fantastic experience!